1930 Maine Inspection Sticker - $20.00 : Bob Hoyts Classic Inspection Stickers, Add a Final Touch to your Restoration! There are conflicting reports on when Maine began Inspections. One report we have is 1930 and another is 1932. 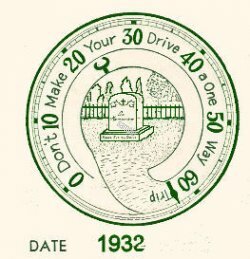 If you know of a 1930 or 1931 or 1932 sticker. we would like to purchase one. We will pay $25.00 for an original or $10.00 for a scan, front and back. In either case we will provide you with a free reproduction sticker. This displayed 1932 sticker is the earliest we have. Buy it by clicking on our 1932 Maine.